As Jesus entered Jerusalem on that last week of his life, his disciples were joined by the many who had heard and seen him preach in Galilee and those who heard about his fame far beyond that region. And they rushed to welcome him. Surely they had heard of his teachings and his works, and believed him to be the Messiah. And so he was. Today, we understand his Messiahship clearly when he said he was sent by God, Whom he called The Father, to rescue us from our sins and call us to repent and turn back to God. He proclaimed God’s Kingdom, and said it was both within us and among the people in the form of himself. And he called disciples to follow him in creating this Kingdom and spreading it throughout first Judea and then the earth. But that wasn’t what many had in mind that day as they welcomed him and proclaimed him “King.” They sought a military leader, someone who would lead a military revolt and overthrow the Romans, re-establishing a literal kingdom of Israel, and bringing justice by the sword, not by words of peace. And within days, almost all of them would be going home disappointed – saddened that THIS Messiah would not be leading a military revolt. They had somehow drastically misread the clear words of Jesus, and their failure to listen would have grave consequences for them and their nation. Jesus was always very clear about his mission. He was clear that this Kingdom was to be brought into this earthly reality by our deeds and actions by following God’s Moral Commandments, and that we would all be judged by those deeds to be deemed worthy to enter in to Eternal Life. His kingdom was “not of this world” and that which belonged to Caesar should be given to Caesar. Every opportunity he was given to sow sedition against Rome, he instead spoke of peace and individual repentance from individual sinful behavior. That’s not the preaching of a revolutionary, conquering Messiah. Perhaps that’s why the Gospels portray even the Roman Prefect Pontius Pilate – who was otherwise known by historians as a brutal, ruthless ruler – as finding no sedition in him at all. Jesus is said to have answered Pilate, "My kingdom is not of this world. If my kingdom were of this world, my servants would have been fighting, so I would not be delivered over to the Jewish leaders. But my kingdom is not from the world." This was a huge disappointment to those who sought a military revolt. His entry into Jerusalem on a donkey, rather than on the massive white horse of a general, was also subtle hint about his true mission. And the day after his triumphal entry, he did something else that was unexpected: he entered the Temple, and there he loudly condemned those who were using it as a money-making venture, rather than a place of pure worship. Today, Christendom – those who supposedly revere him and his teachings – continue to misunderstand him. They, like his contemporaries, believe him to be a conquering king who’s going to come back and smite all of his enemies – secular “Romans” – in a bloodbath. Most are quick to worship and admire him, and make his death and return to God into a magical charm that absolves them of the hard work of living in Righteousness as Jesus commanded us to do, rather than obeying his words and honoring his teachings. And many make God’s house into a money-making venture, rather than a pure house of worship. So as we greet Jesus as he enters Jerusalem, let’s renounce those misunderstandings and look back to Jesus and his actual teachings. Let’s stop looking for a conquering General who will make our lives easier by simply killing our enemies and giving us all of Rome’s riches so we can live easily and in physical comfort in this life. Let’s instead remember that we are greeting God’s chosen Prophet – the one who brings us a Good and Beneficial Message (“Gospel”) that tells us if we turn from our sins, we may live with God eternally, and live the Righteous life God wants us to live here on earth. God chose Jesus, adopted him, and sent him out to preach His Truth. They are rarely preached, and aren’t emphasized as much as later teachers’ words. Why is that? Jesus, after all, is our Master, and if we believe he is our Master, ought his teachings be the CORE and the center of our Faith in God, Who sent Jesus out to preach? His clear teachings, which call on us to perform Good Works, to seek heavenly treasures rather than earthly ones, to pray and act righteously without doing so just to be seen by others, to actively serve others, especially the poor, to turn the other cheek, to love and pray for enemies, and to go the extra mile in all that we do, HAVE NEVER BEEN CHANGED. Nor can we explain them away or minimize their importance, or allow others to do so. 5) Righteousness and Sinfulness CANNOT be inherited. 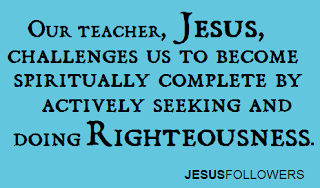 Jesus tells us that there is no substitute for DOING righteousness. Righteousness is always stated by Jesus as something we must DO, just as it was in all the other books of the Hebrew Bible. It cannot be inherited from another, even Jesus. Our own acts must be our own, and our own righteousness is required from us. God, through the Prophet Isaiah, tells us (1:16) "Wash yourselves; make yourselves clean; remove the evil of your deeds from before my eyes; cease to do evil, learn to do good." Ezekiel (18:20-21) says: “The soul who sins shall die. The son shall not suffer for the iniquity of the father, nor the father suffer for the iniquity of the son. The righteousness of the righteous shall be upon himself, and the wickedness of the wicked shall be upon himself. But if a wicked person turns away from all his sins that he has committed and keeps all my statutes and does what is just and right, he shall surely live; he shall not die." We alone are responsible for our own sins and good deeds. Jesus says we are judged not by our words, not by our intentions (and certainly not by another's) but by our own ACTS and DEEDS, and them alone. God expects us to obey his moral commands, as Jesus repeated consistently. He said that no one else would be charged with our disobedience, and no other would be responsible for our actions except ourselves. The life that Jesus calls on us to pursue in his Gospel is a life of works, action, radical love and service to others. 6) Salvation isn't "faith alone," nor our "works alone" but it's God alone who judges our worthiness for salvation. For centuries, clever men have enjoyed taking the words of Jesus and ripping out a phrase here and there, and proclaiming that ONLY belief in Jesus is necessary for eternal salvation. Of course, this does the words of Jesus and his Gospel a grave injustice, because it is not what he taught. In truth, belief - in Jesus' plan of repentance and righteousness, not just belief "in" him - is only a first step in our Faith, and Jesus always portrays it as such. Simply professing belief, without accompanying that belief with active Good Works, is worthless. (James 2:19) Jesus, in the only time he was asked explicitly how one achieves eternal life, answered, "You know the commandments: 'Do not murder, Do not commit adultery, Do not steal, Do not bear false witness, Do not defraud, Honor your father and mother.'" (Mark 10:17-19) That is the Gospel message of Jesus - obedience to God's moral Law. But it must be said, we cannot do WORKS ALONE without Faith, because our Faith is based on the teachings and example of Jesus. Without a faith in Jesus grounded in following his teachings, carrying his cross and holding his message in our hearts daily, we have no idea what "works" to do, nor how to do them. Since Jesus pleased God with all he did (John 14:12) we ought to hold his example before us at all times. We must strive to enter the "narrow door" of Salvation (Luke 13:24) humbly allowing GOD ALONE to be our ONLY judge of worthiness. 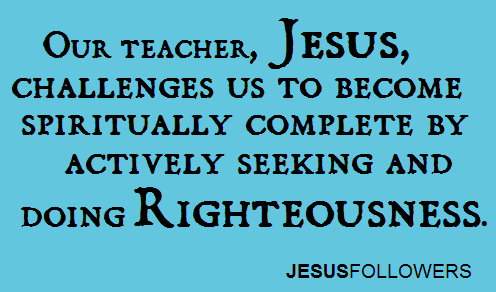 7) If we claim to follow Jesus, we give up the right to be selfish and life for ourselves. Jesus taught that being selfish was wrong, and to serve others - even before ourselves - is our mission here in this life. Going the extra mile, feeding the hungry, housing the homeless, comforting the sick, are all simple, clear teachings of our Master. We are called to be servants of others, and that we will be rewarded with Heaven - closeness to God forever - if we obey God's will for our lives, which was purely exemplified by Jesus' life. The best way to show that we are followers of Jesus is by showing love towards, and serving, others. Jesus says we must deny our SELVES, taking up our crosses daily, and love one another, just as he loved us. (Luke 9:23; John 15:12) If we call Jesus our friend and Master, we will do all that he asks us to do. He calls us to love and care for others without reservation, selflessly, and in all purity. The teachings of Jesus are clear, consistent and powerful. Jesus said his words would last forever - would not pass away. And his teachings about how we should act in this world were profound. If we understand this, we will naturally put Jesus' clear, plain teachings at the center of our Faith, and they would obviously be placed at the core of any teachings about that Faith. And yet, modern Christianity has been bogged down with man-made words and man-made doctrines that muddle Jesus' teachings and message, and often obscure it entirely, making them of no effect and little importance. Many of man's clever words give birth to man-made doctrines that turn Jesus' religion toxic. Let’s begin to examine some hard truths modern Christians need to hear about what they’ve been taught that aren't consistent with the teachings of the one they claim to call "Master." 1) A Faith in Jesus actually means following his teachings. Churches rarely focus on them – and in fact, sometimes rarely speak them from the pulpit or TV screen – but the teachings of Jesus aren't just the core of the Gospel, they ARE the Gospel. In his Great Commission, Jesus called those who followed him to go out into the world telling people to obey ALL that he taught them. (Matt. 28:20) When Jesus says "Take up your cross daily and follow me," (Matt. 16:24) he's calling us to join him on a journey of joyful obedience, love, and service, one just as he embarked upon. But if we do not seek to follow his words, if we claim these words and teachings are too hard for us, impossible for "mere" humans, not necessary for our salvation, or not relevant for us today, then we are not really following Jesus, but other men's teachings. In fact, we HATE him if we reject, warp or minimize his teachings. It's clear from all of these sayings of Jesus, that he believed being called a follower of Jesus, or having faith in him, meant that we are to following his teachings. 2) Prayer doesn't put God to work granting our wishes, it puts us to work serving others. Many Christians want God to be our magic genie, our butler and our doorman, and He cannot be any of these. And even as Jesus consistently preached that we should desire spiritual things and not earthly treasures (Matt. 6:19-20; Luke 12:33) many Christians pray to God for new cars, more money, a promotion and for an end to sickness and pain. That’s witchcraft, not faith in God. We should be seeking God’s help to overcome adversity, endure suffering, avoid temptation, and grow stronger from all that the world sends our way, and speak to God about all things and all of our troubles and concerns. When King David prayed to God, he prayed seeking to be renewed and for his soul to be restored (Psalm 23:3) and acknowledged that it was God Who would lead him towards righteousness. This is just as it should be. Through the example of Jesus, the one God has anointed as His Spokesman, we know that God wishes us to seek Him in prayer for spiritual, not material, things. Let us pray with honor and respect to the One Who created us and has the ability to give us all the spiritual help we need from his vast spiritual storehouse. 3) If you're waiting for God to clothe, house and feed you, you're doing the Gospel backwards. Are we fully prepared to face all of life's challenges? We can be. But we can't if we're paralyzed by the thought that we don't have the "right" opportunities before us. Some people are waiting for God to act, to "open a door," to make things "right" for us so we can finally be the people God wishes us to be. They wait, sometimes a lifetime, for God to "put the right person" into their lives, either a mate or a boss or a benefactor. Service to others leads to spiritual completeness. (Matt. 5:48) “I was naked and you clothed me, I was sick and you visited me, I was in prison and you came to me" (Matt. 25:36.) We are called to serve others' needs. That's how God's Kingdom becomes established here on earth. Let's be about our Father's business and do as Jesus calls us to do! He declared that a leading object of his mission was to call sinners to repentance. (Mark 2:17.) To deny the efficacy of repentance would be to render the mission of Jesus a nullity. In his Sermon on the Mount he appears altogether in the character of a practical preacher. When he upbraided the cities in which most of his mighty works were done, because they repented not, he spoke of their impenitence as the sole cause of their destruction, Chap. 11:20-24. He taught that men will be accepted or rejected according to the use they make of the talents entrusted to their care; that when brought to judgment, they will be received to glory, or doomed to punishment, according to their works (Chapter 25.) Throughout his ministry he taught men to expect salvation, and every blessing, on the ground of the love, mercy and favor of God, solely on the terms of repentance and obedience to the Gospel. The Gospel is undoubtedly a system of divine mercy and grace, but in this system conditions are certainly comprehended. The conditions are repentance, faith, and obedience. Without a compliance with these conditions sinners cannot be saved. We have redemption in Jesus as we have it in his Gospel: he came and revealed it, he lost his life in making it known, he is appointed by the Father to dispense it, and we enjoy it so far as we conform to his teaching and example, so that we should not henceforth live to ourselves, in the gratification of our evil passions and desires, but to him, in obedience to his Gospel, and in the imitation of his example, especially of that generous love which he manifested in laying down his life for the good of men. Jesus can be an example to us only so far as he was like us in nature, state and circumstances, or as we are capable of becoming like him. Had he never suffered, he could not have been an example to us in suffering: Had he not died he could not have been an example to us in dying. Had he not perfectly obeyed he could not have been an example of perfect obedience. But now by his death, his character is perfected, his qualifications are completed, his testimony is finished, his obedience is tried and, found perfect, he received a glorious reward, and we have a suitable and perfect example of every excellency attainable by us. 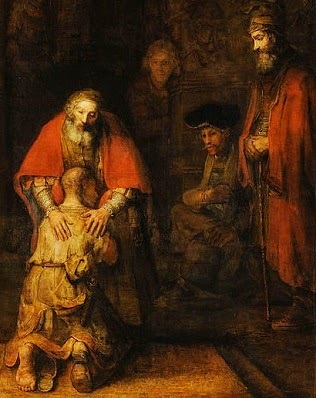 In the Parable of the Prodigal Son, Jesus teaches us that we are to rejoice and be accepting of those among us who return after wronging us. The parable also teaches us that God is ready and waiting for those who return to the path of righteousness. In the parable, a son asks for his inheritance early and goes away, only to squander it on lustful living. He exhausts his money and returns to his father's house, seeking a job as a servant. But the father, even before he reaches his gate, runs out to greet him, and immediately forgiving him, prepares a feast for him. In this way, Jesus teaches us to endlessly and without hesitation forgive others, in the same way God forgives those who return to him in repentance. When asked how many times we must forgive others, Jesus said "70 times 7 times." Our repentance for our sins - just as the boy who return to his father - satisfies any Justice God requires for transgressing his moral Law, because God is not a monster, but a loving Parent who wants us to live in peace with Him and with our fellow human beings. Mercy is given by God to those who ask for forgiveness and accept it. That's the contract; that's the "price" to be paid, just as the price the Prodigal Son paid was returning to his father in humility. But the way that Forgiveness, Justice and Mercy are understood by many Christians would force us to radically re-tell the parable, because, like Jonah, some Christians are very angry that God so easily forgives. Seeking inspiration not from Jesus' teachings, but from angry medieval lawyers and kings, they have created, and spread, a doctrine of God's Justice that is the enemy of God's Mercy. It is a doctrine in which God CANNOT simply forgive without a blood sacrifice - someone MUST pay the "price" for a sin. But God's mercy is NOT the enemy of God's forgiveness. Both exist in equal measure in the heart of our loving God, Who is eager to forgive us upon our repentance alone. In their telling of the story, it must be re-written, so that the Prodigal Son's vengeful father would stop the boy at his gates and then demand that his eldest son be slaughtered in order to satisfy the sins of the youngest who sinned against his father. Only then, when the elder son's blood was spilled, would the payment be accepted. This may have been a perfectly reasonable way to achieve justice in the ancient world, but if we put our belief solely in Jesus' teachings, and not in other mens', we know that this is not how God shows Mercy OR Justice. While we may decide that some people do not deserve God's mercy, and must first "pay a price" for falling short of His high standards, God does not condemn based on our whims or theories about who is "in" and who is "out" of his loving embrace, either now or eternally. In the parable, even when the son "was yet a great way off," the father ran to meet him, and "fell upon his neck and kissed him" (Luke 15:20.) When Jesus calls us to forgive others as God has forgiven us, does that mean we have a duty to exact a blood payment from those whom WE wish to forgive? The opposite is true. We must forgive 70x7 times, joyfully and without hesitation. God cannot be held to our human standards of how Justice and Mercy should work. And we should be extremely grateful for that.